America’s mainstream religious denominations used to teach the faithful that they would be rewarded in the afterlife. But over the past generation, a different strain of Christian faith has proliferated—one that promises to make believers rich in the here and now. Known as the prosperity gospel, and claiming tens of millions of adherents, it fosters risk-taking and intense material optimism. It pumped air into the housing bubble. And one year into the worst downturn since the Depression, it’s still going strong. Like the ambitions of many immigrants who attend services there, Casa del Padre’s success can be measured by upgrades in real estate. The mostly Latino church, in Charlottesville, Virginia, has moved from the pastor’s basement, where it was founded in 2001, to a rented warehouse across the street from a small mercado five years later, to a middle-class suburban street last year, where the pastor now rents space from a lovely old Baptist church that can’t otherwise fill its pews. Every Sunday, the parishioners drive slowly into the parking lot, never parking on the sidewalk or grass—“because Americanos don’t do that,” one told me—and file quietly into church. Some drive newly leased SUVs, others old work trucks with paint buckets still in the bed. 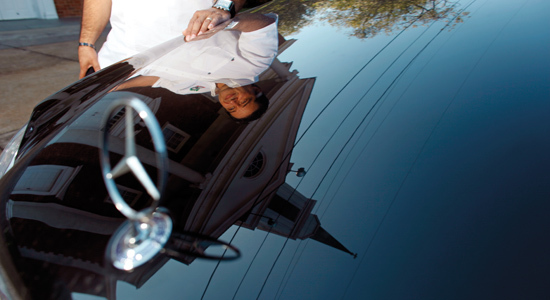 The pastor, Fernando Garay, arrives last and parks in front, his dark-blue Mercedes Benz always freshly washed, the hubcaps polished enough to reflect his wingtips. Pastor Garay, 48, is short and stocky, with thick black hair combed back. In his off hours, he looks like a contented tourist, in his printed Hawaiian shirts or bright guayaberas. But he preaches with a ferocity that taps into his youth as a cocaine dealer with a knife in his back pocket. “Fight the attack of the devil on my finances! Fight him! We declare financial blessings! Financial miracles this week, NOW NOW NOW!” he preached that Sunday. “More work! Better work! The best finances!” Gonzales shook and paced as the pastor spoke, eventually leaving his wife and three kids in the family section to join the single men toward the front, many of whom were jumping, raising their Bibles, and weeping. On the altar sat some anointing oils, alongside the keys to the Mercedes Benz. I had come to Charlottesville to learn more about this second strain of the American dream—one that’s been ascendant for a generation or more. I wanted to try to piece together the connection between the gospel and today’s economic reality, and to see whether “prosperity” could possibly still seem enticing, or even plausible, in this distinctly unprosperous moment. (Very much so, as it turns out.) Charlottesville may not be the heartland of the prosperity gospel, which is most prevalent in the Sun Belt—where many of the country’s foreclosure hot spots also lie. And Garay preaches an unusually pure version of the gospel. Still, the particulars of both Garay and his congregation are revealing. Among Latinos the prosperity gospel has been spreading rapidly. In a recent Pew survey, 73 percent of all religious Latinos in the United States agreed with the statement: “God will grant financial success to all believers who have enough faith.” For a generation of poor and striving Latino immigrants, the gospel seems to offer a road map to affluence and modern living. Garay’s church is comprised mostly of first-generation immigrants. More than others I’ve visited, it echoes back a highly distilled, unself-conscious version of the current thinking on what it means to live the American dream. One other thing makes Garay’s church a compelling case study. From 2001 to 2007, while he was building his church, Garay was also a loan officer at two different mortgage companies. He was hired explicitly to reach out to the city’s growing Latino community, and Latinos, as it happened, were disproportionately likely to take out the sort of risky loans that later led to so many foreclosures. To many of his parishioners, Garay was not just a spiritual adviser, but a financial one as well. Many of the terms and concepts used by prosperity preachers today date back to Oral Roberts, a poor farmer’s son turned Pentecostal preacher. Garay grew up watching Roberts on television and considers him a hero; he hopes to send all three of his children to Oral Roberts University, in Tulsa, Oklahoma. In the late 1940s, Roberts claimed his Bible flipped open to the Third Epistle of John, verse 2: “Beloved, I wish above all things that thou mayest prosper and be in health. Even as thy soul prospereth.” Soon Roberts developed his famous concept of seed faith, still popular today. If people would donate money to his ministry, a “seed” offered to God, he’d say, then God would multiply it a hundredfold. Eventually, Roberts retreated into a life that revolved around private jets and country clubs. Roberts’s fame had faded by the late 1980s, and prosperity preaching briefly imploded soon after. We all remember Tammy Faye Bakker and her mascara tears, along with her husband, Jim, and his various scandals. They took their place in a procession of slick, showy faith healers on Christian television who ultimately succumbed to earthly temptation. But since that time, the movement has made itself over, moving out of the fringe and into the upwardly mobile megachurch class. In the past decade, it has produced about a dozen celebrity pastors, who show up at White House events, on secular radio, and as guests on major TV talk shows. Kirbyjon Caldwell, a Methodist megapastor in Houston and a purveyor of the prosperity gospel, gave the benediction at both of George W. Bush’s inaugurals. Instead of shiny robes or gaudy jewelry, these preachers wear Italian suits and modest wedding bands. Instead of screaming and sweating, they smile broadly and speak in soothing, therapeutic terms. But their message is essentially the same. “Every day, you’re going to live that abundant life!” preaches Joel Osteen, a best-selling author, the nation’s most popular TV preacher, and the pastor of Lakewood Church, in Houston, the country’s largest church by far. Among mainstream, nondenominational megachurches, where much of American religious life takes place, “prosperity is proliferating” rapidly, says Kate Bowler, a doctoral candidate at Duke University and an expert in the gospel. Few, if any, of these churches have prosperity in their title or mission statement, but Bowler has analyzed their sermons and teachings. Of the nation’s 12 largest churches, she says, three are prosperity—Osteen’s, which dwarfs all the other megachurches; Tommy Barnett’s, in Phoenix; and T. D. Jakes’s, in Dallas. In second-tier churches—those with about 5,000 members—the prosperity gospel dominates. Overall, Bowler classifies 50 of the largest 260 churches in the U.S. as prosperity. The doctrine has become popular with Americans of every background and ethnicity; overall, Pew found that 66 percent of all Pentecostals and 43 percent of “other Christians”—a category comprising roughly half of all respondents—believe that wealth will be granted to the faithful. It’s an upbeat theology, argues Barbara Ehrenreich in her new book, Bright-Sided, that has much in common with the kind of “positive thinking” that has come to dominate America’s boardrooms and, indeed, its entire culture. On the cover of his 4 million-copy best seller from 2004, Your Best Life Now, Joel Osteen looks like a recent college grad who just got hired by Goldman Sachs and can’t believe his good luck. His hair is full, his teeth are bright, his suit is polished but not flashy; he looks like a guy who would more likely shake your hand than cast out your demons. Osteen took over his father’s church in 1999. He had little preaching experience, although he’d managed the television ministry for years. The church grew quickly, as Osteen packaged himself to appeal to the broadest audience possible. In his books and sermons, Osteen quotes very little scripture, opting instead to tell uplifting personal anecdotes. He avoids controversy, and rarely appears on Christian TV. In a popular YouTube clip, he declines to confirm Larry King’s suggestion that only those who believe in Jesus will go to heaven. Osteen is often derided as Christianity Lite, but he is more like Positivity Extreme. “Cast down anything negative, any thought that brings fear, worry, doubt, or unbelief,” he urges. “Your attitude should be: ‘I refuse to go backward. I am going forward with God. I am going to be the person he wants me to be. I’m going to fulfill my destiny.’” Telling yourself you are poor, or broke, or stuck in a dead-end job is a form of sin and “invites more negativity into your life,” he writes. Instead, you have to “program your mind for success,” wake up every morning and tell yourself, “God is guiding and directing my steps.” The advice is exactly like the message of The Secret, or any number of American self-help blockbusters that edge toward magical thinking, except that the religious context adds another dimension. A few pages later comes the corrective, the model of a “victor” and not a “victim.” Osteen and his wife, Victoria, are walking around their neighborhood in Houston when they pass a beautiful house being built. “Most of the other homes around us were one-story, ranch-style homes that were forty to fifty years old, but this house was a large two-story home, with high ceilings and oversized windows,” he writes. “It was a lovely, inspiring place.” Victoria desperately wanted a house “just like it,” but Joel was worried about how stretched they already were. “Thinking of our bank account and my income at the time, it seemed impossible to me,” he writes. But this, of course, is an example of ungodly, negative thinking. With her unwavering faith, Victoria wouldn’t let it drop. Soon she convinced Joel and then he, too, started to believe that “God could bring it to pass.” There is no explanation of how they came to own such a house—whether Osteen worked hard to grow his ministry or got rich from his TV show or received an inheritance from his father’s estate. In this story they are standing in for an average middle-class couple who set their sights on a bigger house and believed, despite all the financial evidence, that God would bestow it upon them, like a gift. And he did. Theologically, the prosperity gospel has always infuriated many mainstream evangelical pastors. Rick Warren, whose book The Purpose Driven Life outsold Osteen’s, told Time, “This idea that God wants everybody to be wealthy? There is a word for that: baloney. It’s creating a false idol. You don’t measure your self-worth by your net worth. I can show you millions of faithful followers of Christ who live in poverty. Why isn’t everyone in the church a millionaire?” In 2005, a group of African American pastors met to denounce prosperity megapreachers for promoting a Jesus who is more like a “cosmic bellhop,” as one pastor put it, than the engaged Jesus of the civil-rights era who looked after the poor. Narratives of how “God blessed me with my first house despite my credit” were common … Sermons declaring “It’s your season of overflow” supplanted messages of economic sobriety and disinterested sacrifice. Yet as folks were testifying about “what God can do,” little attention was paid to a predatory subprime-mortgage industry, relaxed credit standards, or the dangers of using one’s home equity as an ATM.